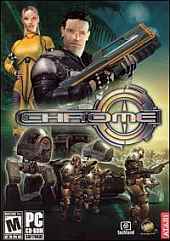 Chrome is a tactical first-person shooter set in the 22nd century in another solar system where large corporations compete to mine a precious metal called chrome. You take over the role of a bounty hunter who has been betrayed and framed by his partner. You flee and are eventually hired by a small mining company which sends you on missions like recovering stolen equipment and rescuing hostages. You soon meet a female who becomes your new partner. Rival companies and meeting your former partner cause you many problems. Weapons are the standard pistols, submachine guns, heavy rifles, and even a rocket launcher but your inventory space will let you only carry a few at a time including other items like ammo and health kits you pick up along the way. There are vastly different difficulty levels with the easier ones allowing you to see a proximity radar while the harder ones can be quite tough without this aid. The missions are quite varied and fun with a few vehicles you can drive like dune buggy-like cars and mechanized walkers as well as the use of cloaking devices. You also have seven implants that enhance some of your abilities like improving your accuracy, hardening your skin or giving you extra speed. The graphics are very good looking and huge levels take place on tropical islands, dense forests, and frozen landscapes. Unfortunately the enemy AI is not that great and the standard multiplayer modes only have a few maps each. It is worth playing for the interesting single player experience.